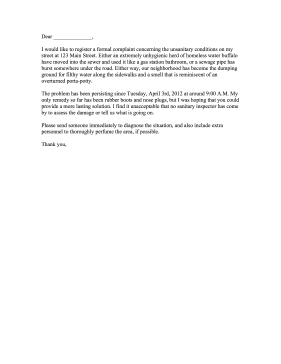 City planners and managing officials should be notified of unsanitary conditions in a community with this complaint letter. I would like to register a formal complaint concerning the unsanitary conditions on my street at 123 Main Street. Either an extremely unhygienic herd of homeless water buffalo have moved into the sewer and used it like a gas station bathroom, or a sewage pipe has burst somewhere under the road. Either way, our neighborhood has become the dumping ground for filthy water along the sidewalks and a smell that is reminiscent of an overturned porta-potty. The problem has been persisting since Tuesday, April 3rd, 2012 at around 9:00 A.M. My only remedy so far has been rubber boots and nose plugs, but I was hoping that you could provide a more lasting solution. I find it unacceptable that no sanitary inspector has come by to assess the damage or tell us what is going on. Please send someone immediately to diagnose the situation, and also include extra personnel to thoroughly perfume the area, if possible.